Now this is a good episode. “Balance of Terror” is the tale of the Enterprise‘s first encounter with a Romulan vessel. Before this encounter, as we learn, no human or Romulan had ever seen each other. The two races had fought a war with primitive “atomic weapons” (so primitive they weren’t even called “nuclear”), and established a treaty along a Neutral Zone buffer between their regions of influence. So much of the well-known Star Trek mythology is established in this episode for the first time, it would be difficult for it not to be a classic episode. The story opens in a wedding ceremony, with Kirk stating his happy position of having the authority to marry couples as the ship’s captain. An odd thing is that everyone at the ceremony is in Starfleet uniform. Including the bride, Angela Martine, whose only concession to tradition is some white feathers arranged in her hair. She is being given away by Scotty, for a reason never explained. Alas, the ceremony is interrupted by a red alert and battle stations, with the news that the nearby Earth Outpost 4 has been attacked. Angela and her fiancé Robert Tomlinson return to their posts in the weapons control room. Spock shows a map of the Outposts and the Neutral Zone – a two-dimensional map showing a linear border with 8 human outpost stations along it. Of course this is a simplification for television, as a space border must be a surface, and would be considerably more penetrable than a linear boundary on a 2D map. We learn that Kirk’s orders with regards to the Neutral Zone are “inviolable”: he must not enter it under any circumstances; the Enterprise and all the Outposts are to be regarded as expendable, rather than risk any incursion into the Zone. Of course, Kirk later ignores this and chases the Romulan war craft into the Zone. We meet Lieutenant Stiles, serving as navigator in this episode. He hates the Romulans, because they killed some of his family. He makes the odd statement that there may be Romulan spies on board the Enterprise – rather a big reach given there’s no evidence presented at any stage that any Romulans have ever breached the Neutral Zone before the present warship. The ship destroys Outpost 4 and turns on the Enterprise, and we hear the evocative Romulan/Klingon attack music for the first time in the series. The ship becomes invisible, “deflecting light rays around itself”, but Spock can somehow track it on his sensors. This physics-bending state of affairs is never explained. One would expect a cloaking device for a spaceship to concentrate on deceiving electronic sensing, not eyeballing, or rather to achieve both or be essentially useless. Spock gets a view on to the bridge of the Romulan vessel, revealing its commander is… his father!! Wait no, that’s Mark Lenard, who would later go on to play Spock’s father, playing the Romulan commander, who is never named. We learn the Romulans resemble Vulcans, which primes Stiles to insinuate that Spock may be a Romulan spy. We later see several scenes on board the Romulan vessel (that the Enterprise crew don’t see), during which it becomes clear that the Romulan Empire is essentially Ancient Rome in Space, with a Praetor back home, and a Centurion as second-in-command on board the ship. And of course there’s the classical allusion to Romulus, founder of Rome. The Romulans flee to a comet tail, which obscures vision and sensors. That’s one unrealistically dense comet tail. The Enterprise fires a bunch of “phasers”, but these actually look like depth charges photon torpedoes. The stand-off is broken when Spock accidentally touches an alarm button, causing Stiles to go ballistic with unconcealed bigotry. Shots are exchanged and damage occurs, with Yeoman Rand making what must be her last appearance grabbing Kirk for comfort in the face of death. Stiles leaves to help in the weapons room, and Uhura takes his place at the bridge navigation/weapons console – she has shown a lot of skills already! When more damage is sustained, Stiles gets in trouble and Spock rescues him, removing Stiles’ bigotry. 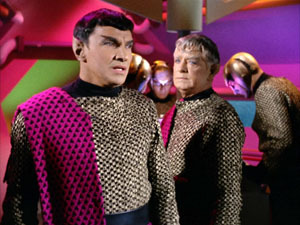 The Romulans are defeated and self-destruct rather than surrender. The only casualty on board the Enterprise is, inevitably, Tomlinson. Angela is stoic in her mourning and Kirk is left to ponder the horrors of submarine interstellar warfare. Body count: Entire personnel of Earth Outposts 2, 3, 4, and 8, including Commander Hansen of outpost 4; entire crew of Romulan Bird of Prey, including commander and centurion; Lieutenant Tomlinson. This entry was posted on Thursday, 7 October, 2010 at 22:42	and is filed under Star Trek. You can follow any responses to this entry through the RSS 2.0 feed. You can skip to the end and leave a response. Pinging is currently not allowed.